And with that, the competition is over. 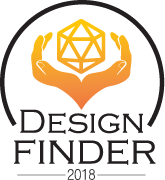 2018 was the first time that we ran the DesignFinder competition, and I think it’s safe to say that Jacob, Mike, and myself were all overwhelmed by the response we got for it. This is definitely something we’re planning on doing again in 2019, but that’ll be covered another time. Now, however, it is time for the big reveal. NATHAN ROSS with his submission The Woe in Wealwood! Copyright © 2018 Open Gaming, LLC.